Pregnancy is a very happy and fulfilling experience for any woman. When a woman is pregnant, her body undergoes a number of different processes. The stages of pregnancy and the journey of nine months are specially demarcated into three trimesters: the first, second and third trimester. In the first trimester or the first stage of pregnancy, which lasts from 0 to 12 weeks, the body undergoes many changes as it adjusts to the baby growing inside it. A lot of the discomforts experienced by women are natural and usually go away as pregnancy progresses. For example, a woman might experience tiredness and fatigue due to the emotional and physical demands of pregnancy. A lot of women complain of exhaustion during this time. This is normal and it is simply the body's way of demanding more rest. This will go away after a while and get replaced with a feeling of well-being and increased energy as the body would have adjusted to the increased demands placed upon it. It is best to have a proper diet, get some adequate sleep and remain relaxed. Mood changes, nausea, vomiting, leg cramps and dizziness are some of the other symptoms associated with the first trimester. 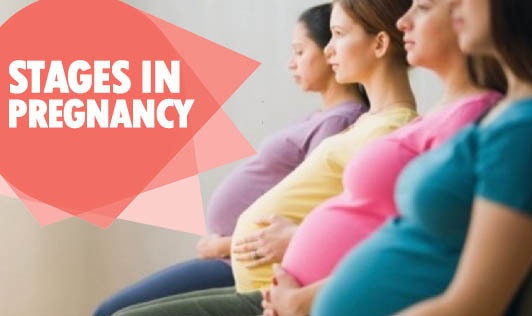 The second trimester or the second stage of pregnancy, which ranges from 12 to 38 weeks, is usually the most physically enjoyable stage for women. It is during this time that the mother usually feels fetal movement for the first time. Some skin changes might occur due to the hormonal changes that the body is undergoing. Stretch marks due to an increase in the belly size is a common occurrence. Some women also complain of having trouble sleeping during this time. The third trimester or the third stage is when the fetus continues to grow and women need to start preparing for the delivery of their baby. Body temperature usually rises as the fetus radiates heat. The ankles, fingers and face might swell and fatigue is definitely an issue during the third trimester. The Braxton Hicks contractions might also be experienced (Pregnancy Trimester Stages and Signs). The stages of pregnancy as mentioned above are the ones that have been decided upon after research and doctors' approval. However, it is possible that some women may experience some of the symptoms a little early or late. If any of these stages of pregnancy do not progress as expected, it is advised to consult a qualified doctor.